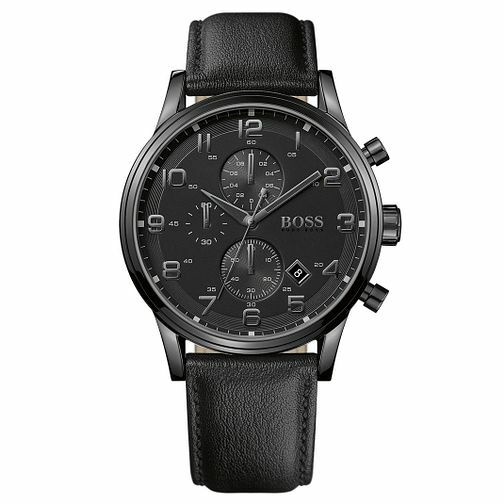 Hugo Boss crafts a timepiece with tones as dark as the night, with clear numerals that enhance the readability of the dial and three separate subdials that help you track subdivisions of time. A date aperture is included to help you track the week and is secured with a stylish black leather strap for enhanced comfort. Hugo Boss Aeroliner Men's Ion Plated Black Strap Watch is rated 4.7 out of 5 by 3. Rated 5 out of 5 by Anonymous from Boss Watch Smart everyday watch does exactly what you need at a decent price. Service was without fault so overall really impressed.